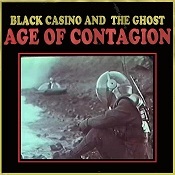 The one thing you can definitely say about Black Casino and the Ghost is that whatever they do, it’s going to be interesting, and probably unlike anything else that you’re seeing or hearing. It’s two years since their last album “Some Dogs think their Name is No” was released and they’re back in the summer of 2015 with new material and live performances kicking off with the release of “Age of Contagion” on June 18, from the new album, “Until the Water Runs Clear” which is due to be released later in the year. If you want to see Black Casino and the Ghost live, they’ll be headlining at The Finsbury in North London on Friday July 10.